This simple tutorial is going to show you how to enable advanced file permissions dialog in Ubuntu 12.04. So that you can set file permissions based on Unix permission model (rwx, rwx, rwx). 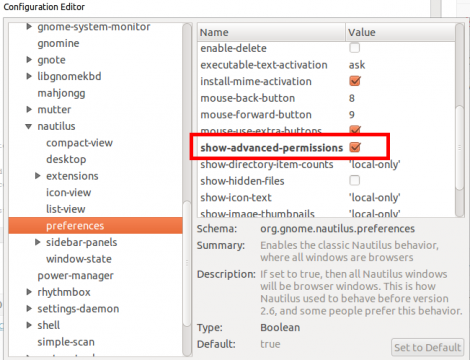 It also allows to Set User ID, Set Group ID and Sticky in Nautilus. Search for and install dconf Editor in Ubuntu Software Center. Press Alt+F2 and type in gconf-editor in command box to open it up. 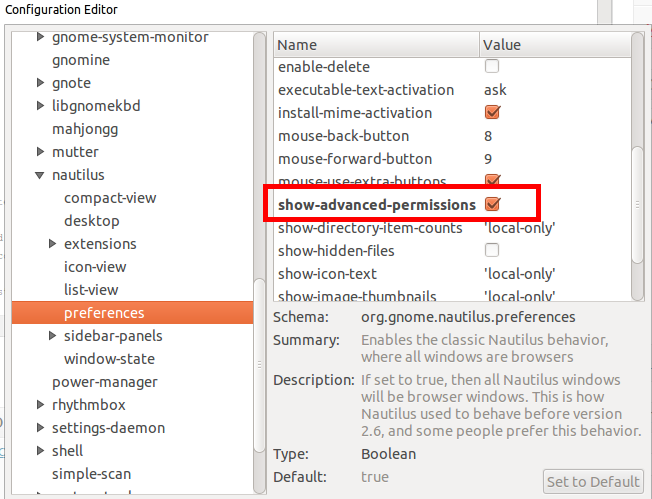 Navigate to org -> gnome -> nautilus -> preferences, check on “show-advanced-permissions” and it takes effect immediately. 2 users responded in " Enable Advanced File Permissions in Ubuntu 12.04 "
You mean gconf, or dconf?